What better way to protect yourself than loading up your firearm with this 9mm Federal personal defense ammunition? Used by law-enforcement officials everywhere, this high powered ammo is sure to give you the protection you need and deserve. 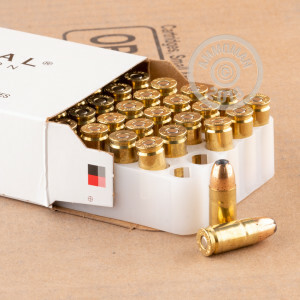 These 50 rounds of 9mm Federal ammunition will arrive in brand new condition. Their reloadable cartridges are cased in brass. Non-corrosive Boxer primers and clean burning powders will keep your handgun clean and performing at its best. The 115 grain jacketed hollow point bullets allow for quick, positive expansion with proven accuracy. Federal Premium Ammunition is headquartered in Anoka, Minnesota. It all began in 1922 when founding president Charles L. Horn established a vision for the company that would continue on for generations to come. 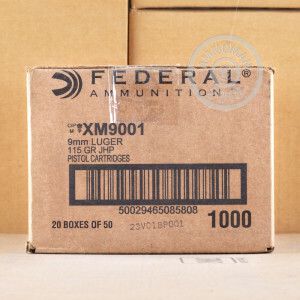 Today, Federal remains one of the leading manufacturers of ammunition in the world. Shipped fast and ammo is good quality and a great price. Fired just fine at the range. 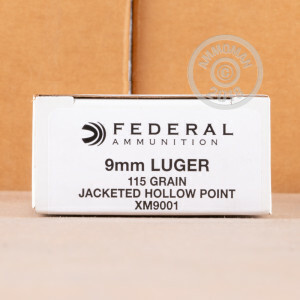 I have been using Federal's 9BPLE 115gr for over 20 years and it is still the best in its class.